I'm Jimi, I live in Amsterdam (The Netherlands) and I'm, while I'm writing this, 18 years old. I'm currently studying informatics at the University of Amsterdam and I work about 4 hours a week at the library of the High School of Amsterdam where I put back the returned books. About a year and three months ago, after lots of problems with free hosts, I decided to buy my own domain: jimbows.net. Despite the fact that the most frequent visitor is still me, the site's popularity has risen quite a bit since more people found out I am hosting the assignments for my study here. Right now, there are about 10 unique visitors a day! When you really pay attention, you may notice that almost all of my websites are still under construction. This doesn't mean that you can't use them. Apart from my forum, every site works fine and can be used. It's hard to say when everything will be finished, because I usually work on a site for a few days or weeks and then take a break for a month or more. However, every page will be finished bit by bit, so keep on checking out my updates page if anything new has been finished. Well, if you, after reading this long story, still want to know more about me, you can read my story of how these pages came about below. It's a bit long, and I don't suggest you read it, but if you really want to, go ahead. It all started when I was in second form. Back then, I followed a flash course to make movies of my own creature: Pinda! After that course was finished, I continued making movies about other things. After a while, I found a tutorial about making games in flash. As it wasn't too hard to understand, I made two games: Pong and a Dutch version of hangman, which is now also available in English. This movie and game making continued until I was in fourth form. Then I became too busy to do it. At that point, I knew nothing about making websites. In fifth form that changed when I got my first informatics lesson. 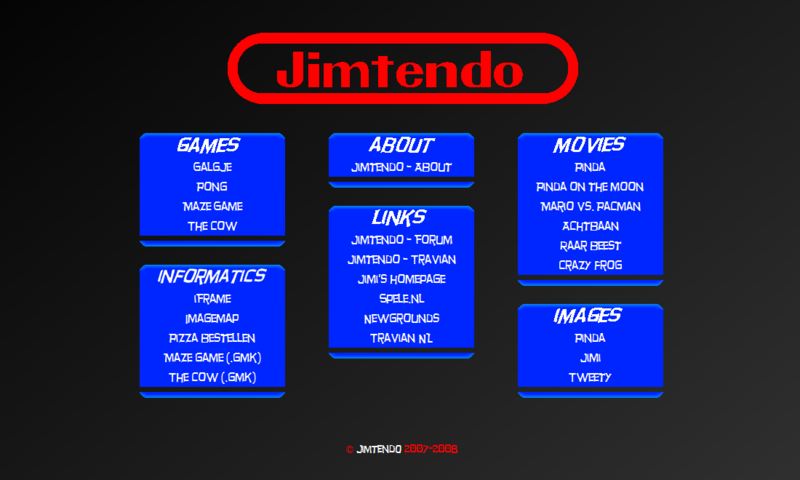 I made a website, called Jimtendo, on which I placed the games and movies I made. It didn't look very nice (screen | live demo), but at least it worked. After a few months, I decided to change the layout. The site became much better looking and a few of my informatics assignments were added (screen). This layout was used until I bought this domain, jimbows.net. Then I decided that all my pages should look the same. You can find the current version of Jimtendo (Jimbow's: Jimtendo Games, Movies and Images V3.0) here. In the first days of jimbows.net, like I already said, Jimtendo's layout had been changed to match the layout of my other pages. 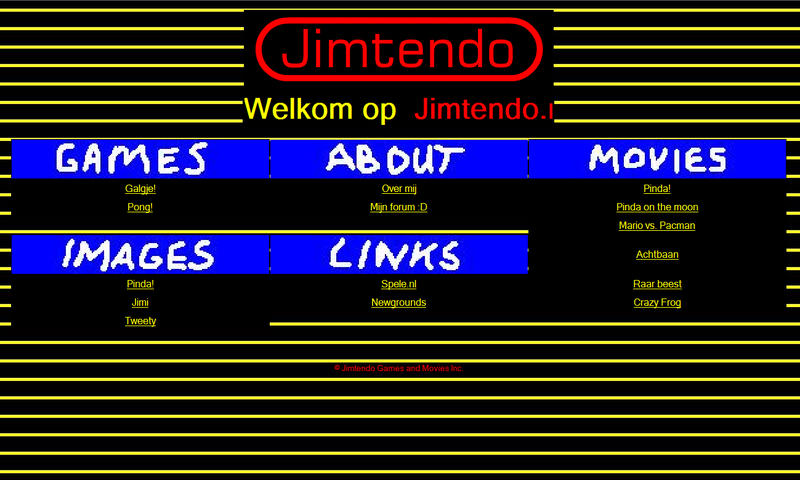 This layout (V2.5) isn't used for Jimtendo any more, but it's still used for my forum and the page I've placed the informatics assignments I got at High School. My informatics teacher really liked what I made. I always got 10 out of 10 points. Therefore I decided to place the best assignments on my domain, so that he can always show the assignments to other pupils. Now about the forum... I got the idea of making one when I was really bored in the beginning of sixth form. It started only as a form by which you could enter your name, which was then inserted into a database. Later you could also insert text and it slowly became a real forum. Because I wanted my forum to look nice, I've tried various layouts and picked out the best. I liked this layout so much that I decided that it should be the layout for all of my web pages. What am I planning to do in the future? Well, I hope to finish my Bachelor Informatics in two years. After that, I'll probably do a Master of one year. And after that? What will I do then? I don't really know it yet. I'll probably start working somewhere in the informatics sector, but I also might want to become a teacher of informatics at a High School. I also still have the dream of starting my own successfull software company. But will it happen? God knows. Now, what will happen to jimbows.net in the future? At first I want to finish the layout swap. After that, I'll finish the last bits of my UvA informatics page and Jimtendo V3.0. Then, I think I will rewrite Jimbow's Home as it still doesn't really work like a charm. And, finally, if I can find nothing else to do, I will restart working on my forum. So, that was that, my story is done. If you've taken the trouble to read all the way through here, thanks for reading!